I always loved those cookies – they have a dough taste to them that I’ve never found before in another cookie and well, who doesn’t love cookie dough?! This recipe produces cookies that are dead ringers for those grocery store cookies. I mean exact. I could’ve easily eaten my weight in these guys. To make the cookies, preheat the oven to 350F. Line baking sheets with parchment paper or silicone baking mats. In a medium bowl combine the flour, baking powder and salt, and whisk together to blend. In the bowl of an electric mixer, combine the butter and sugar and beat together on medium-high speed until soft and fluffy, about 2-3 minutes. Beat in the eggs one at a time, mixing well after each addition and scraping down the bowl as needed. Blend in the vanilla. With the mixer on low speed, add in the dry ingredients mixing just until incorporated and evenly mixed. Cover and chill the dough for 1 hour. To frost the cookies, place the powdered sugar in a medium bowl. Add the melted butter, vanilla, and milk to the bowl and whisk until smooth. Whisk in additional milk as necessary, 1 teaspoon at a time, until you reach your desired consistency. Tint with food coloring if desired. 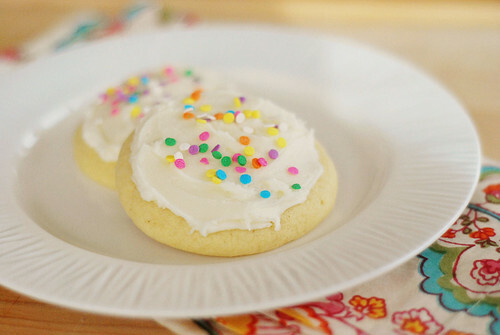 Use an offset spatula or spoon to frost the cooled cookies. 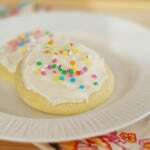 (If the frosting begins to thicken as you decorate, just continue to whisk in small amounts of milk to keep it workable.) Top with sprinkles if desired. Store in an airtight container. 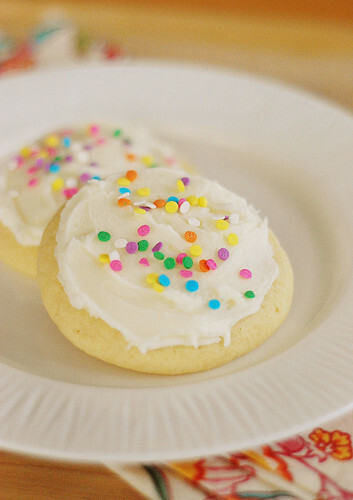 17 Responses to "Soft-Frosted Sugar Cookies"
Oh I am soooooo trying these. When I had my Lofthouse Cookie Fail over Christmas, I was using a different recipe (that called for the dough to be rolled out and cut with cookie cutters). I like this version so much better. I should have checked Annie’s blog first!! I’m probably making these this weekend. Really? Because I’ve seen them and have been skeptical. You are making me want to try them! Oh no, I didn’t realize that the recipes floating around now were exactly like the real things! This is bad bad news. I have been tempted to make these for a very long time. May need to add me to the list of bloggers who have made these soon. Ive been wanting to try these too. I tried a recipe once and it kinda bombed. How did these come out? Just as good even better? They are really good, and I’m not down with super sugary cookies. Fun to make too, and possibilities are limitless with fun decorating options. I bought these so many times when I was in college and I never once noticed that Lofthouse was the brand. It’s a good thing I’m so observant :) I loved this homemade version too, and you’re right they’re JUST like the store-bought ones! These are just so CUTE!! So festive and adorable. These look so good- would love one with a cup of tea! They were a hit. I’ve been dying to make more since I kept so few.